Why didn't you integrate a hub motor? Short answer: it's not as good as a geared motor. We actually tested a lot of hub motors but we don't think they can offer the same performance of a geared motor. Let's start with the more common situation on the electric bikes since it's the same thing. 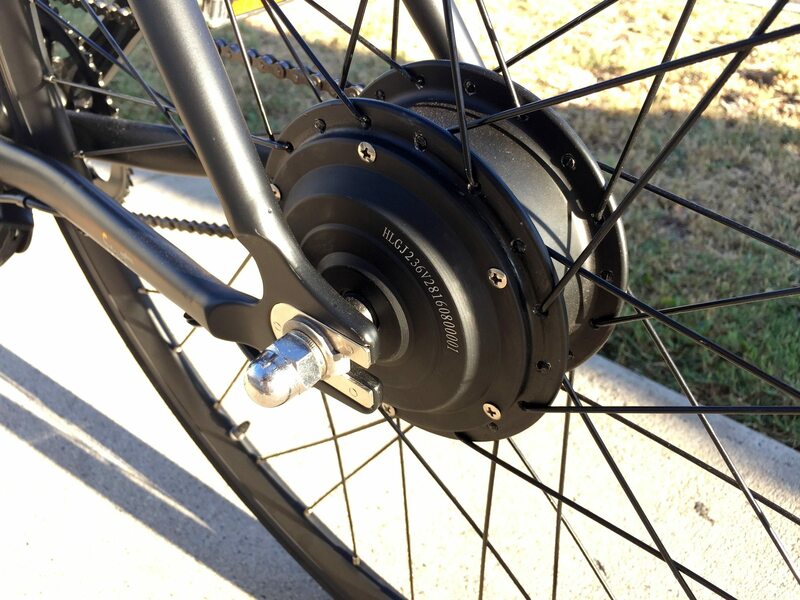 City bikes, which are economically cheap, usually packs a hub motor (picture below) on the front or the rear wheel. The motor is completely separate from the drivetrain. They also add additional weight to the wheel which reduces balance. Performance bikes instead, with a pricing that varies from 1000€ (or 1000$) to 3000€ (and beyond) all utilize a mid-motor that is geared inside. This drives the chain forward instead of the wheel itself. This guarantees the best performance, in particular when a gear reduction is needed such a hill climbing. This design is also much more robust and keeps the point of mass centered. If you want to read more about this topic I recommend you this article by EBR-. As I said we tried several hub motors from different manufacturers. We also bought a couple of Chinese electric skateboards with hum motors to test. One of the models actually stopped working after 3 minutes of usage and we were not able to get it to work again. PRO: the friction is very minimal, the motor wheel runs freely almost like a regular wheel. When you ride it, it feels like a regular skateboard. PRO: You almost don't see the motor, it's hidden inside the wheel and it gives your electric skateboard a stealthy look. With just one hub motor the acceleration is very slow (not so exciting) and the breaking is not firm enough to stop you completely and safely. You would need at least 2 hub motors and a bigger battery but this would, of course, increase the weight. Instead, we focus on portability and we want to keep the electric skateboard lightweight so you can carry it everywhere as a really personal vehicle. Hub motors have a problem with overheating since they are not able to dissipate heat very well being inside the wheel. Overheating is the limiting factor of any electric motor. When the temperature increases, the heat melts the isolation around the copper wires, making the motor completely useless. Sure, hub motors are the future but they are not perfect yet. We will probably use them someday but right now.